Left to right: Kimberly Ann Tucker, Linsey Jobe, Beverly Tuberville, Nicole Stratton. On a dreary, cold Saturday in April, Nicole Stratton was bopping around the plaza in front of the gold-domed New Hampshire Statehouse, making sure Concord’s March for Science rally was moving along. Short and lively, with shoulder-length red hair, Stratton reminded me of a spring robin. Wearing a fleece jacket, skinny jeans, and scuffed brown boots, she gave personal hellos to everyone there: upbeat, cheerful, welcoming. The rally, she beamed, was essentially running itself. Her volunteer marshals, in their screeching green safety vests, were assigned to their corners. Groups like the Five Rivers Conservation Trust, the New Hampshire Science Teachers Association, and the Citizens’ Climate Lobby had set up folding tables under 19th-century orator and statesman Daniel Webster’s bronze gaze. Local singers and guitarists took turns on the modest pine stage Stratton’s husband had built, using the sound system her father had rigged up. Other than the 2,000 or so marchers—overwhelmingly middle-­aged, speckled with kids and dogs—downtown Concord, with its brick and granite buildings and white church spires, was mostly empty on this Saturday morning, the Legislature and its business elsewhere. That was fine with Stratton. Her goal for the day wasn’t lobbying, but getting everyone signed up and ready to do more when they got home. Two days after the election, “I brought my children and my father to this march in Manchester, and it was pretty intense, and I understood how many people were frustrated, and I just started to organize.” By the following weekend, she had planned her first rally in Concord. The weekend after that, she was at yet another demonstration, this time in Keene. By November 27, she had helped create a public Facebook page that gave followers daily action updates and kept them informed about what was happening around the state. On Inauguration Day, they became an Indivisible chapter. Indivisible had come into being around Thanksgiving, when a couple of ex-congressional staffers, Leah Greenberg and Ezra Levin, who are married, helped write an outline of how they’d seen the tea party block Obama and posted it online. Clear, crisp, and practical, the “Indivisible Guide” laid out an easy-to-follow plan for pushing members of Congress to resist Trump’s agenda. They hoped the document would be read by a few friends and family. But soon it was being downloaded hundreds of times an hour, and the couple had to enlist scores of volunteers to help them respond to requests to be listed as Indivisible contacts. As of May 8, the guide had been downloaded or viewed more than 3 million times. Hundreds of thousands of people had signed up. Nearly 6,000 local chapters were registered—among them Stratton’s group in New Hampshire. Happy Friday! Here is a video of Republican politicians getting yelled at for supporting Trump. Becoming an Indivisible chapter was an obvious step for Stratton. The Indivisible movement drives home the message that for the duration of the Trump administration, the most important stance is resistance—and the most effective action is to let those who represent you in Congress know exactly how you feel about the Trump agenda. Call every single day, following a script coordinated with others in your group. Go to your representatives’ town halls and speak your mind. Visit your members’ local offices every week. Stiffen the Democrats’ spines, and weaken the Republicans’ resolve. Prevent Trump from destroying your country. Historically, many political movements have been spearheaded by women, be it abolition or temperance or the Argentin­ian Mothers of the Plaza de Mayo. The progressive social movements boiling up over the last decade, many also organized by women, have been driven by people whose daily security is profoundly threatened: gay and transgender youth, fast-food and domestic workers, the Dreamers, Black Lives Matter. Many of the women who’ve joined Indivisible might have sympathized or even aided those activists, but they nevertheless felt secure in their personal lives. With that in jeopardy they now feel entitled—and obligated—to act. And they’re doing so by marshaling the skills they’ve learned in their professional and personal lives: If I can get a new playground put in or supervise a school system or make partner in a corporate law firm, I can hold my senator to account. All they needed was the instruction manual. So why is it that ladies are leading the anti-Trump resistance? Many of the women I spoke with in their 50s and 60s felt that they finally had the time. Whether they work outside the home or not, they’re likely freed up in middle age, no longer having to drive the kids to baseball, oversee homework, keep the domestic engine running efficiently. Older women have long been the workhorses of community life, holding fundraisers, volunteering at the hospital, serving on the library committee. Indivisible is just a different place to channel that energetic overflow. Others point to fury. “It wasn’t just that Hillary lost,” Tuberville, the founder of Indivisible Oklahoma, told me. “It was that she lost to a disgusting man that none of us could stand”—which felt far too familiar. “Working in corporate life, you see the jerk get the promotion when the more qualified woman is asked to pick up the coffee.” She continued: “Everyone has a Trump story, whether it’s an ex-husband or a boyfriend or a father or an uncle or a boss, especially a boss.” With the stakes so unbearably high, she had no choice but to act. When asked whether their groups were predominantly white and middle class, most of the organizers I spoke with apologetically acknowledged that yes, that was true—in part because organizing via Facebook means reaching out to friends of friends. Given that Americans’ social networks are often pretty homogeneous, it’s no surprise that their Indivisible groups are as well. There were exceptions, of course: Alma Castillo’s El Paso, Texas, chapter is 80 percent Hispanic, surely in part because she and her brother, who first registered the chapter, are naturalized Mexican immigrants. But the white women quickly told me how hard they were working to build coalitions with those on the front lines of Trump’s attacks: immigrants, Muslims, Planned Parenthood, LGBTQ groups, anyone who needs health care. In Virginia, Tucker told me, “I really do believe that the work we’re doing across this country with Indivisible is changing, or has the potential to change, our country in ways that are as significant as just resisting the Trump agenda. Because what we have is a group of people who went from being afraid or nervous or having never contacted a congressman by phone or email, being intimidated by the thought of going to a congressional district office, who are doing it on a weekly basis.” Now they’re monitoring their local school board and tracking the Virginia Legislature’s votes and calling city council members about kindergarten. And nearly everyone I spoke with was recruiting talented people—often but not only women—to run for office. 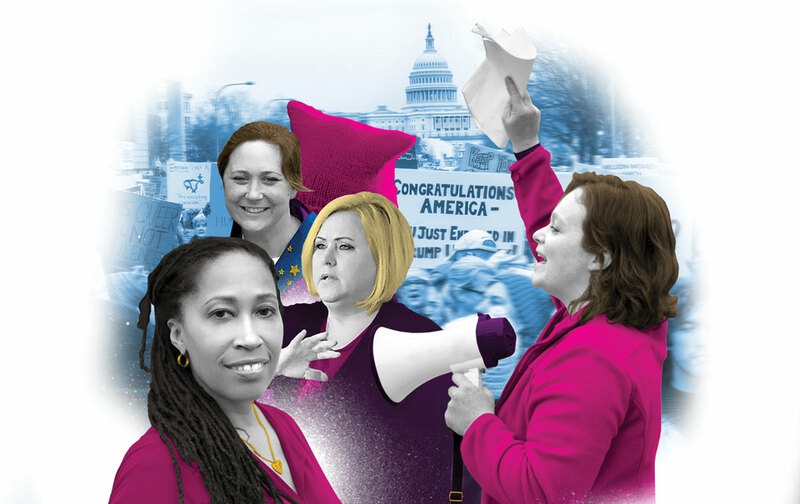 Such efforts are already paying off: Emily’s List, which helps fund pro-choice candidates, reports 13,000 women have contacted the group since the election, as opposed to 920 before November. And according to the Federal Election Commission, 525 new Democrats have signed up to run in the 2018 midterm elections—up 73 percent from this point in the 2014 midterms. On June 13, Tucker won Virginia’s 81st District’s Democratic primary against another Indivisible member, with whom she had run an exceedingly collegial race, by 2-to-1. “I was ecstatic about the turnout,” Tucker told me. She said that in three months her campaign had knocked on 3,000 doors and contacted thousands more people by phone and social media—and that it will spend the summer doing still more, with the goal of upping turnout in November and flipping the district. “Democrats are very motivated right now.” All those resistance phone calls, she explained, had just whetted everyone’s appetites for change. I recalled leaving an Indivisible meeting in Providence, Rhode Island, where I spoke with a wispy 80-year-old woman who said all these newly energized folks were going to make the nation better. “Maybe we needed Trump,” she said, before her eyebrows shot up and she clapped her hand over her mischievous grin. Portraits from left courtesy of Kimberly Anne Tucker Campaign, Linsey Jobe, Beverly Tuberville and Katelyn Hennigar.